While the inner Solar System is bounded by the asteroid belt, the outer planets are bounded by its big brother - the Kuiper Belt. This huge mass of small icy bodies begins at the orbit of Neptune and extends around 5,000 million miles further out into space, making it some 20 times wider than the asteroid belt. Here, you see it represented as the faint grey area. The smaller circle is the orbit of Pluto and the larger is that of enticingly named Kuiper Belt Object 1998 WW31. Yes, the former ninth planet of the Solar System is found within it, as well as two other dwarf planets, Haumea and Makemake. These are, by definition, the largest objects within the Belt. Typically, most of the other bodies are considerably smaller - much less than 100 miles in diameter. They all seem to have the same composition - icy compounds such as methane, ammonia and water. This makes them similar to comets and it was once thought that short period comets (such as Halley) originated from within the Belt. More recent research suggests that the Scattered Disc is their source. The Kuiper Belt was hypothesized as far back as 1930, but it wasn't until 1992 that its existence was proved by direct observation. Although it's not known for certain, the Belt is thought to consist of "planetesimals" left over from the protoplanetary disc existing at the birth of the Solar System. The trouble is, accurate models of the Solar System's formation suggest the Belt should have a total mass equivalent to around 30 Earth masses, whereas the whole of this vast Belt has been measured today as being no more than one tenth the mass of Earth. Thus, 99% of the Kuiper Belt's mass has disappeared! It must have been there in the beginning, to enable the formation of the larger dwarf planets within it. So, where's it gone? This is the name given to a computer simulation of the first few millennia in the life of the Solar System and it goes a long way to account for the loss of this 99% of mass. It suggests that the planets Uranus and Neptune formed originally much closer to Jupiter. Then, gradually, these two, together with Saturn, began to shift orbits away from the Sun. Jupiter, conversely, began to move closer. The turning point came when Jupiter and Saturn settled into orbits that had a 2:1 resonance - that is, for every one orbit of the Sun by Saturn, Jupiter made two. This arrangement had a profound effect on Uranus and especially Neptune, whose orbit was sent even further out, becoming more eccentric. It moved into the young Kuiper Belt and the result was that these small bodies were scattered here there and everywhere, most being flung out into deep space. It was by this action that the Kuiper Belt was reduced in mass to that which we know today. Although designated a "belt", Kuiper is, in fact, quite thick, so it more resembles a donut. The gravitational effect of Neptune is still felt and this force is still capable of scattering the icy bodies out into deep space. Thus, the belt features empty gaps where this has occurred. There are a number of notable areas within the Belt. This is the area between 4,000 million and 4,500 million miles out from the Sun. Here, members of the Belt are in a stable resonance with Neptune, so are able to maintain nice, steady orbits. However, within this, there seem to be two different sets of Kuiper Belt Objects (KBOs). The "dynamically cold" population all seem to orbit more or less along the plane of the Solar System in a pretty circular path. The "dynamically hot" population, on the other hand, have orbits inclined as much as 30 degrees out of the solar plane. The cold ones are a lot more red in appearance than the hot, suggesting they originated from different places. This strange word is a collective name for KBOs that are not controlled by orbital resonance from Neptune. They typically have an orbit outside of that planet, with low eccentricity, that, unlike some other KBOs, does not cross its orbit. The name comes from the first one to be discovered, designated QB-1. When others were spotted, they were referred to as "QB-1-o's" - or "cubewanos". This is a weird phenomenon of the Kuiper Belt that has scientists puzzled. At around 4,650 million miles out, the Belt suddenly stops dead, after which there is just an empty void. This does not fit with the theorised model of the Belt, so an explanation has to be presented to account for it. One of the things that could sweep the area clean in such a way is a large Earth-sized planet. This then leads to the long-time speculation of the existence of a ninth planet, as yet undiscovered, the famous "Planet X". Some scientists dismiss this as nonsense, but it would account for the "cliff". As stated higher up this page, the three dwarf planets found within the Kuiper Belt have their own page elsewhere on this site. However, some other KBOs are worthy of note. The year 1998 saw the discovery of this cubewano. It is, very approximately, 380 miles in diameter. Lying 4,250 million miles out from the Sun, its orbit takes 309 years. This orbit is inclined some 12 degrees out of the solar plane. It rotates once every four days. Varuna is a cubewano that was discovered in 2000. Regarding its size, it's very difficult to make an accurate estimate. Its diameter could be anything from 560 to 625 miles. With a reddish hue, its orbit is inclined some 17 degrees out of the solar plane. One journey around the Sun takes 283 years. It rotates once every 6.34 hours and such a fast spin rate has led astronomers to speculate that it may be an ellipsoid (i.e. rugby ball shaped). This KBO, discovered in 2001, has an orbital resonance with Neptune, meaning it is designated a "plutino", rather than a cubewano. With a diameter of about 400 miles, it lies 3,690 million miles from the Sun, which it orbits in around 250 years. Its rotational period has yet to be determined, but this rotation has been observed to cause changes in its reflective brightness. The year 2002 brought the discovery of this KBO. Its size is very much a matter of contention. Over the years, scientists have suggested anything between 525 and 783 miles in diameter. The current accepted value is 667. In any event, this makes Quaoar the largest cubewano found to date. It orbits the Sun at around 4,000 million miles in 286 years. Its rotational period is just under 18 hours. There is a smaller body, around 50 miles diameter, orbiting round it, making it a binary system. This smaller body has been christened Weywot. This is Neptune's largest moon and, while obviously not part of the Kuiper Belt now, is thought to have originated from there. It was captured by the giant planet's gravity and settled into a retrograde orbit (orbiting Neptune in the opposite direction to its rotation). 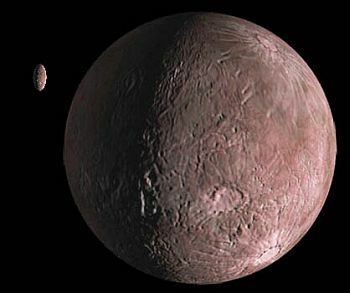 Triton is the only large moon in the solar system to do this. It is thought that Saturn's moon, Phoebe, was also once a KBO.